Both still tired from our long day to Skagway yesterday, we decided to sleep in. With nothing definite on our agenda, we relaxed this morning and posted clues for the letterboxes we planted yesterday. After a late lunch at the cabin, we finally decided to get out and explore a bit. 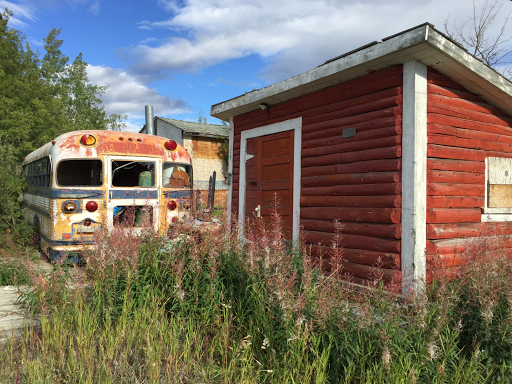 With the promise of a recently found letterbox at the Takhini River rest area on the Alaska Highway, we decided to drive the 40 or so miles to check it out. 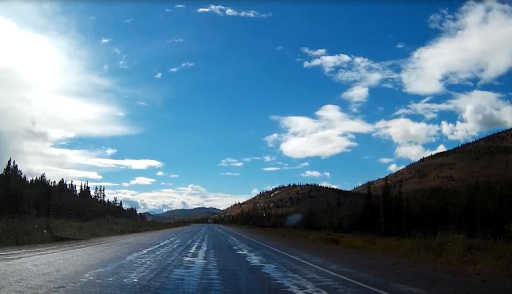 Unlike the flawlessly smooth South Klondike Highway, this section of the Alaska Highway was an unpredictable guessing game. 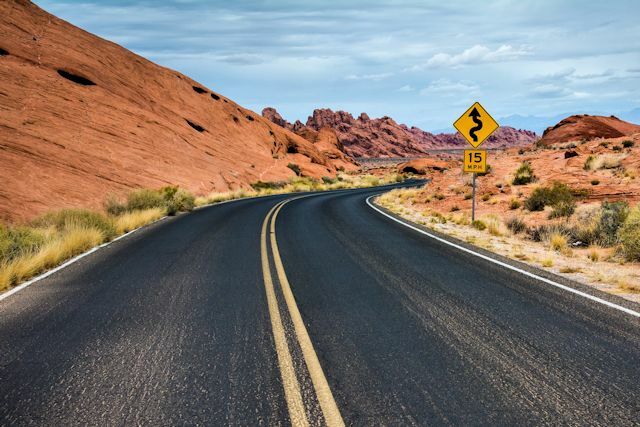 Potholes, ruffling patches, washboard bumps and roller coaster dips were commonplace. In places, gravel from the shoulders had encroached onto the roadbed to be kicked up by the tires of passing vehicles and hurled at unsuspecting windshields. It certainly wasn't as bad as some of the stories one hears, but it was quite a step down from the South Klondike. As we drove through the Ibex Valley, signs of the advent of autumn sprang up in patches of yellow foliage. The broad valley floor is home to thousands of slender evergreens, few taller than 30 feet and most much shorter. Occasional stands of white birch add variety and later, color. The valley belongs to the Takhini River, which flows east into the Yukon near our cabin. Frozen over in winter, the river forms part of the course for the annual 1,000-mile Yukon Quest sled dog race from Fairbanks to Whitehorse. After finding the letterbox at the rest area, we decided to continue on to Haines Junction, another sixty or so miles away. About halfway there, we stopped at the behest of a camera icon on a scenic overlook road sign. That led us to the Canyon Creek Bridge rest area. Not only did we snap a couple of pictures, we left a letterbox in exchange. The first bridge spanning Canyon Creek was built at this spot in 1920 to haul supplies to Silver City, a mining camp. 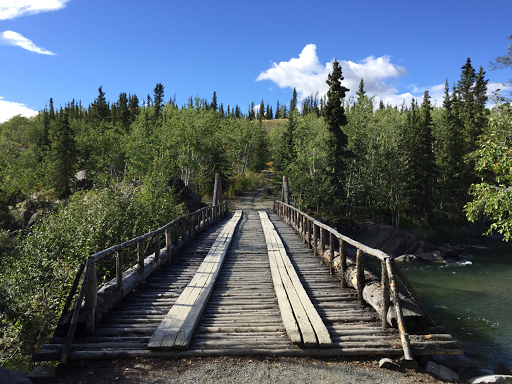 During the construction of the Alaska Highway in1942, the log and board bridge was rebuilt as part of the new highway. 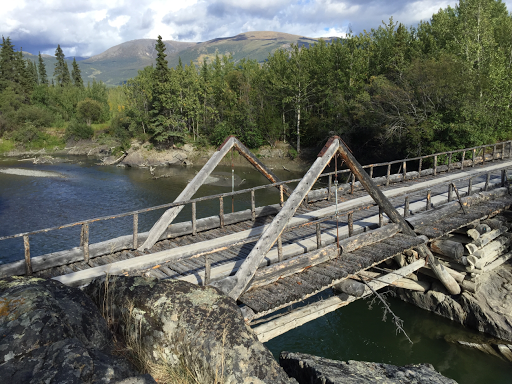 The construction is typical of original Alaska Highway bridge designs. 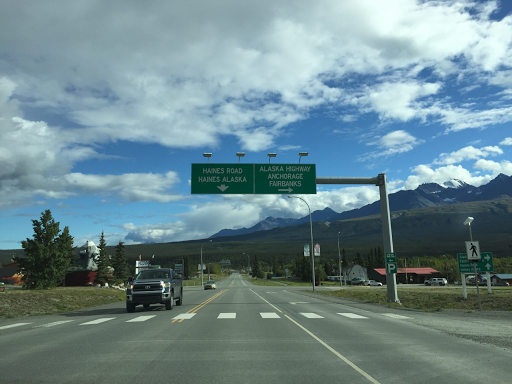 Established in 1942 to support the Alaska Highway construction, Haines Junction (pop. 589) earned its name from its position at the intersection of the Alaska and Highway 3, which leads to Haines, Alaska, 150 miles south. Upon our arrival in town we started our search for a couple of letterboxes hidden there. "Find the Muffin," one clue directed. Muffin? We found a local bakery but there was no muffin in sight. Finally we stumbled back to the main highway and Ken spied a large sculptural mountain with native animals perched on it. The wooden base which installers added to the artwork did inadvertently make it look like a muffin with a ridged paper liner. 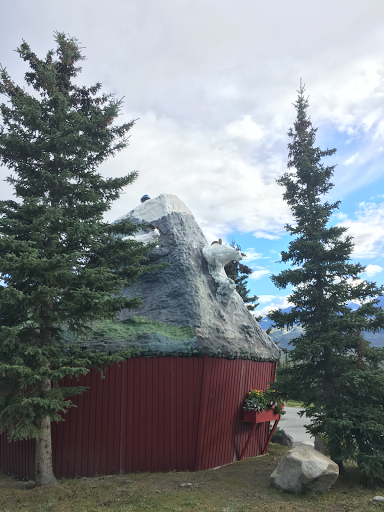 Townspeople have taken the nickname in stride and even erected an "I Saw the Muffin in Haines Junction" life-size cutout for tourists to snap souvenir photos. 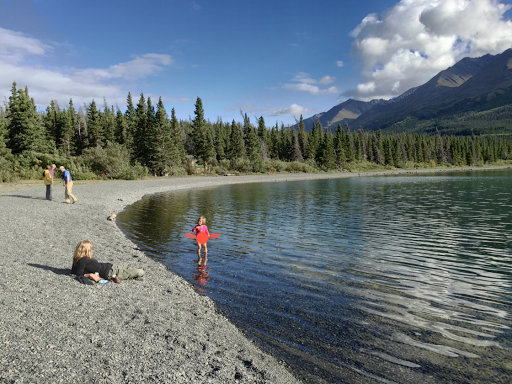 Turning south on the Haines Highway, we drove a few miles toward Lake Kathleen in Kluane National Park. Shortly after we turned south, a road sign reminded us to check our fuel level as the next available petrol would be in Haines, Alaska, some 150 miles away. Mountains of the Kluane Range loomed to our right--husky granite pyramids with sharp treeless peaks. Finally we found a road leading to a small finger of the large Kathleen Lake. A dozen other visitors were scattered about, enjoying the lake--picnicking, walking, lounging and, in the case of a two-year-old Danish toddler, wading in the icy water, with her mother hovering nearby for protection. Because the late afternoon sun was so bright, it was only later when reviewing photos we took at the lake that I noticed the child was pantless. Oops! On our way back through Haines Junction, an unusual sight caught our eye. 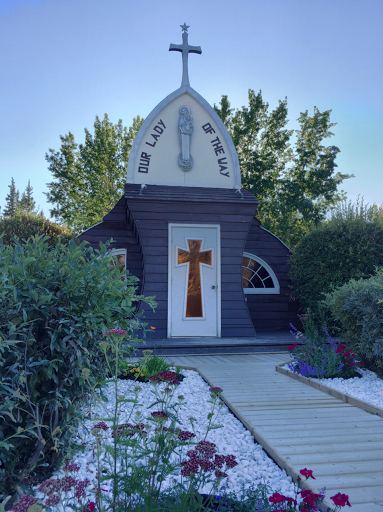 Our Lady of the Way Catholic Church is not your typical church architecture. With limited funds at his disposal, the first Catholic priest to preach the gospel in this area had to be resourceful. The church needed a building. Old Quonset huts had been left behind by U.S. military personnel when they completed the Alaska Highway construction. 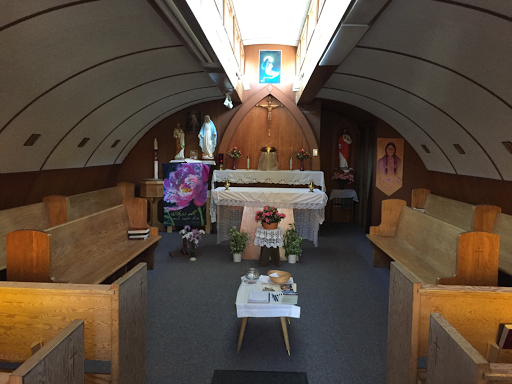 Father Morriset put two and two together and created a chapel with distinctive architectural style. 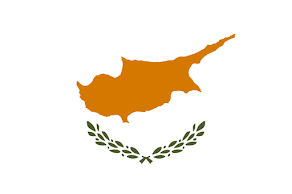 That was in 1954. Today, the church still attracts attention and visitors, as evidenced by their guest book in the diminutive sanctuary. One more letterbox at the Haines Junction airport on our way out of town and we were headed back a little after 7:30. By the time we arrived at our cabin, it was 9:15 and still fully daylight. It's not our usual pattern any more to be on the road that late, but serendipity rewards us for stepping out of our normal routine. 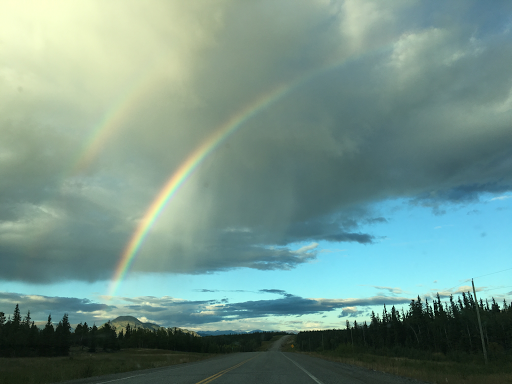 As we approached Whitehorse, a vibrant rainbow spread across the sky for us to drive under its arc. Tomorrow we'll bid farewell to Whitehorse and the Yukon, flying 700 miles northeast to Yellowknife. Staying on those boards must have been a challenge. Harsh weather takes its toll.